​Julia Woning of the Netherlands has found a unique way of using Max to support her pan pastels. Just look at all those luscious cakes of color! 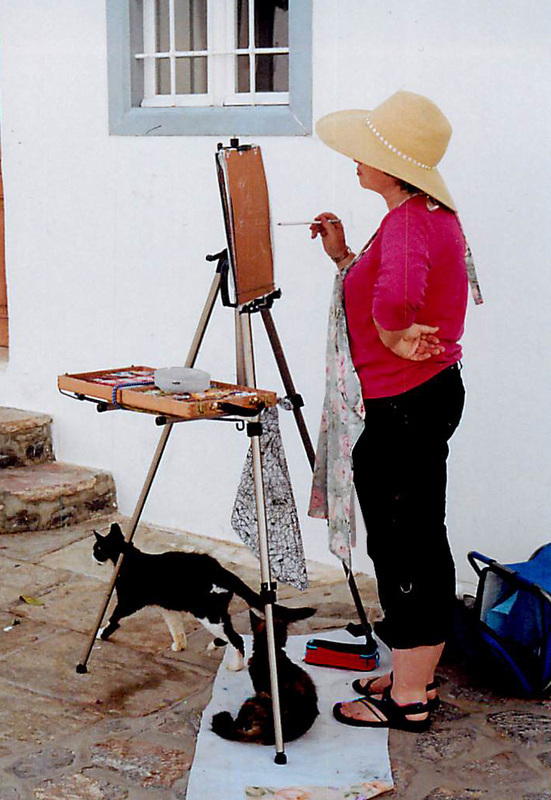 Julia's works in different mediums and some of her work can be seen in our Classic Showcase. ​Beautiful Carolyn Schrock of Chapel Hill, North Carolina keeping cool in Sedona, Arizona. I see that like me, Carolyn prefers to mount her pastels to the side rather than in front of her. I have shoulder problems and find that side mounting saves my having to over-extend my arm to get past the pastel box. ​Even though it's been almost a year since Max came into my life, I have not forgotten your kind invitation to share photos and artwork. I have not been able to get out and paint this year as much as I'd hoped to, but when I do get out, I LOVE LOVE LOVE my Easel Butler. Not just because it's easy and quick to set up, and not just because it places my extra pastels at a convenient height so I don't have to bend down to the ground (yikes! ): but also because it has helped me significantly lower the weight of my plein air gear, since pastels in cardboard boxes -- which rest on Max -- are much lighter than pastels in wooden boxes. So I can carry more pastels in a lighter pack. Yay! I have attached a photo for you of my set-up, taken during my most recent outing -- you can see Max stoically holding my pastels at the photo's bottom. My thanks again for such a simple -- but brilliant! 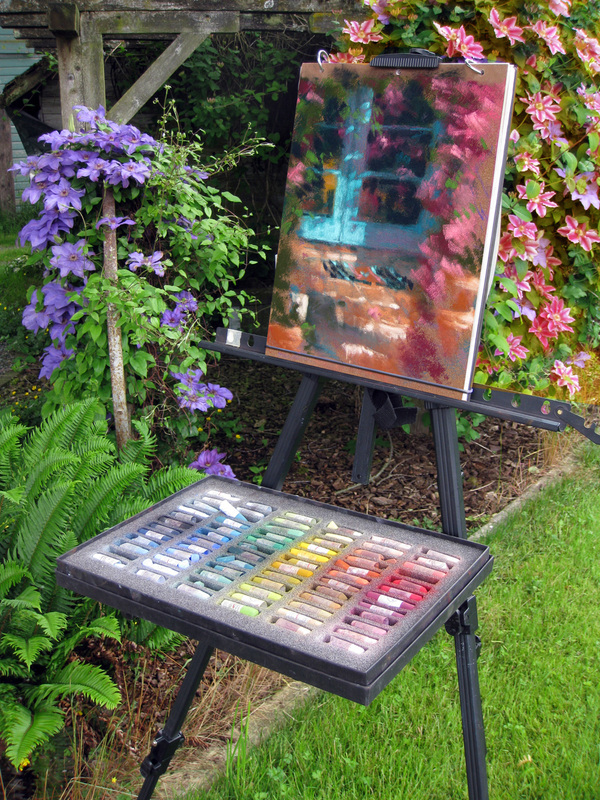 -- idea: it has made my outdoor painting much easier (and as I am in my 60's, that's a big deal). Max loves basking in the Tasmanian sunshine! Max and I are Plein Air painting in a sheep paddock in Tasmania. Max is so light & packs away to nothing , I don't know what I'd do without him and...he is multi functional - best buddy ever ! Did you KNOW that the holes for the Easel Butler perfectly fit the wood pegs for the Take-it Easel? I removed the square wire fittings on the pegs so that the Easel Butler holes could slide fully onto the peg. I can now position the shelf a bit higher for my palette as needed. When the Take-it Easel requires a narrower footprint, the Easel Butler metal fitting adds extra stability! 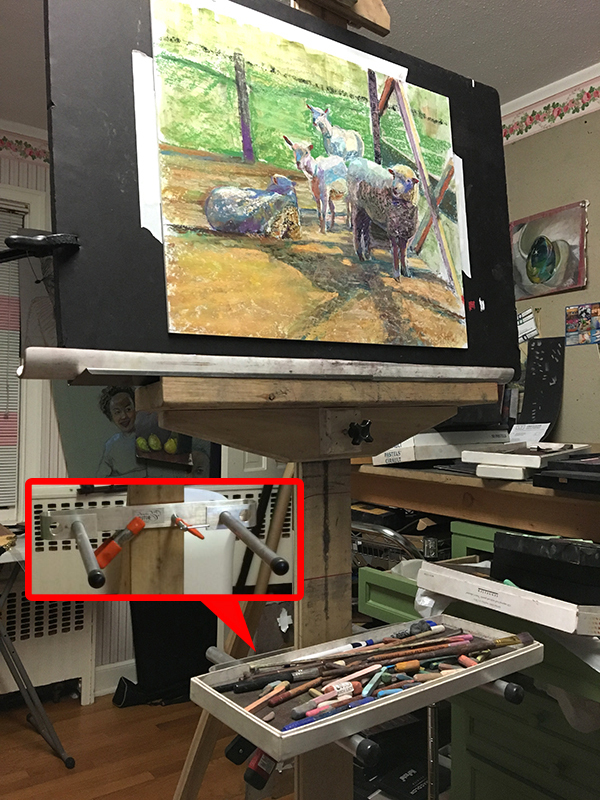 This easel is Karen's wooden beauty that she has attached Max to by means of a simple C-clamp in order to hold her active pastels. Here is Max on my new tripod with my Heilman box which weighs 13 lbs. Worked great! Nice and secure. The temperature had already reached a balmy 92 degrees, with the air and wind taking turns showing me the true value of air conditioning. The real problem of the day was, how do you get two pastel boxes, an easel, and assorted supplies to a remote island in the middle of the ocean? 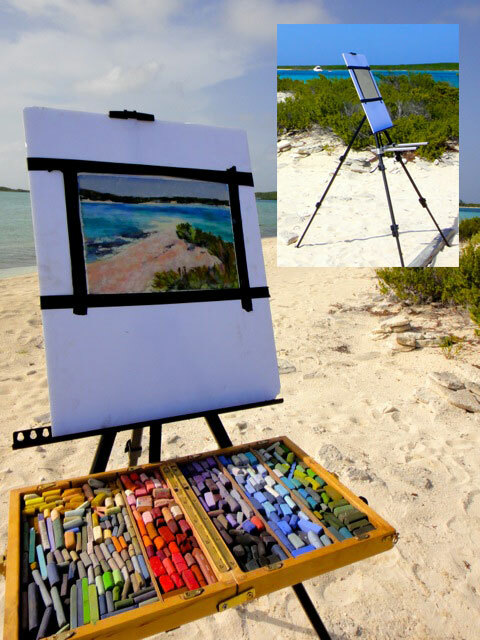 Finding a suitable beach, my husband offered to do the heavy lifting, and after delivering my fragile pastels in dry and perfect condition to the beach, he patiently snorkeled around and waited for the Monet to appear on my canvas. 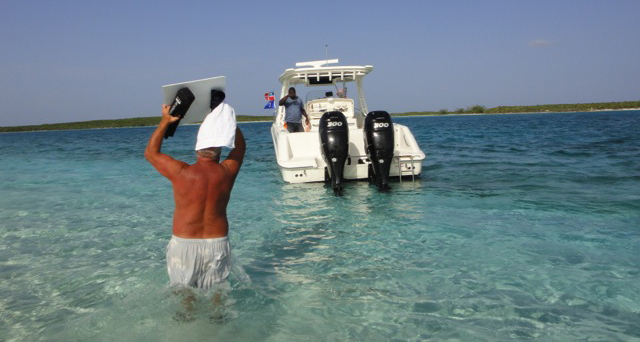 The sun was frying me like a Bahamian Conch and the wind kept trying to blow over my little easel. Beach birds dive bombed me with cheerful cries as hermit crabs glared from under their little shell helmets. How can I possibly paint here? With a little help from Easel Butler, my portable aluminum easel, and some boards I found scattered in the sand, I set up with fingers crossed that the wind wouldn’t blow over my pastel set once I finally committed it to the stand and was rewarded with a really nice field study which I finished in my studio! 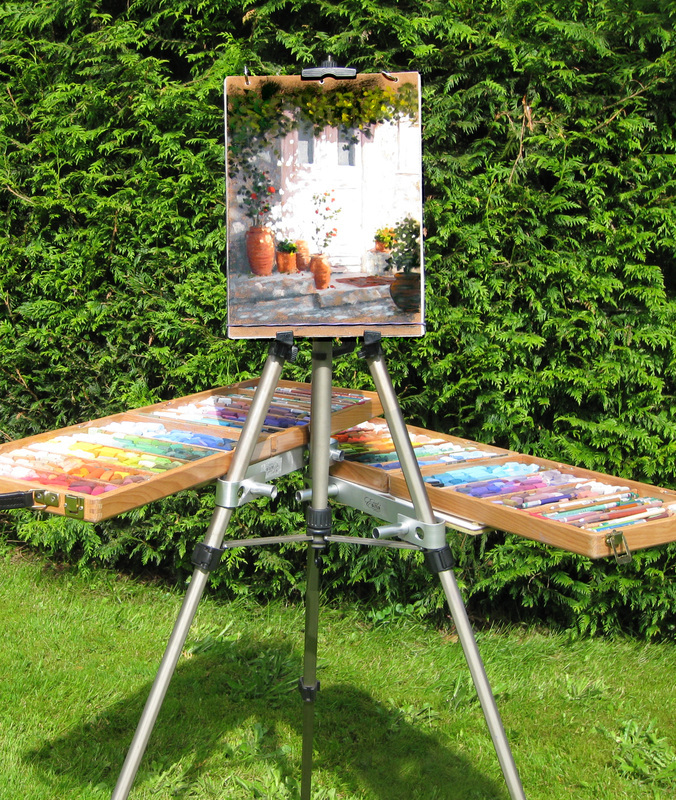 I used your Easel Butler on a 2 week trip to France with other artists and 2 instructors. It worked great, was lightweight to carry, and provided a sturdy place to put my wooden pastel box. I was able to bungee the box to the easel, add a counterweight the easel and was confident that even in the wind, all would be fine. • The first is intended for times when I know I’ll have to carry my equipment a considerable distance or when I’ll be traveling by air. 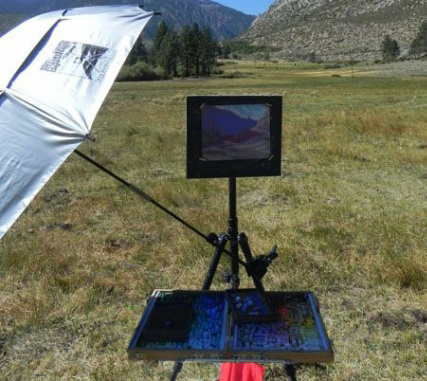 It consists of a small, sturdy professional- grade camera tripod fitted with an extension arm available from Easel Butler that securely holds my pastel palette while an easel support, available from Heilman Designs, holds the painting surface and is attached to the tripod camera quick-release plate via an accessory plate." 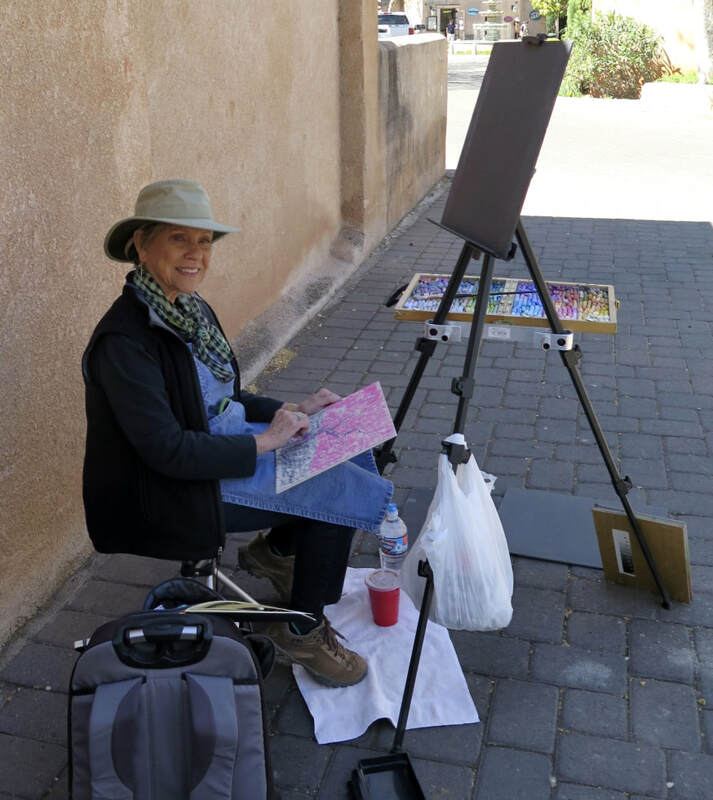 She has just started a blog of her Plein Air adventures leading up to a trip to the Greek islands...another escapade for Max!! Click on the above photo to see close-ups of Kathy's set-up and note how nicely Max snuggles in there and DO check out the weight of her whole kit and kaboodle except for her pastel box. Impressive!! On the easel in most of these photos including this one is our ArtWorksBooks. 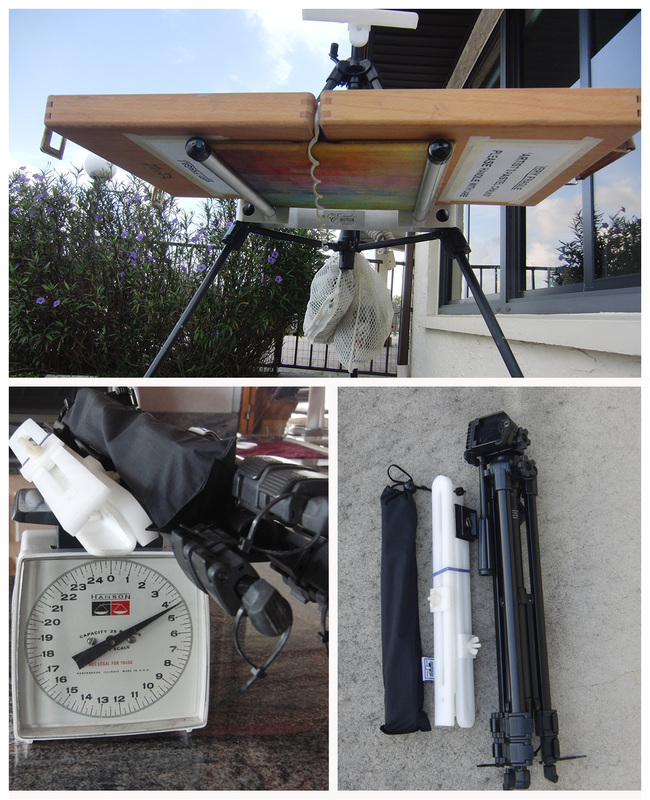 "This is my All in One easel on a Cullmann Magic 2 tripod. In theory, the All in One is self contained, but you can see the added bonus of the Easel Butler with baking pan in making a convenient shelf for tools, 'Gloves in a Bottle', water...you name it." We have suggested to Jann that she take advantage of the options shown on the helpful hints page of just how to insert the arms into Max's various positions that allow for him to sit higher on her tripod making it even more convenient for her and further away from marauding raccoons. 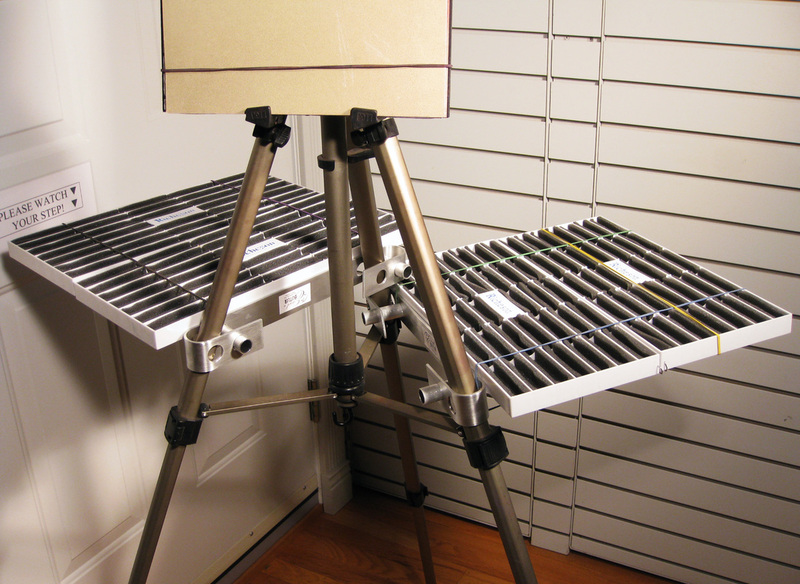 No fancy pastel case here…just a starter set of 72 Unisons and an ArtWorksBook on a Windsor Newton easel. 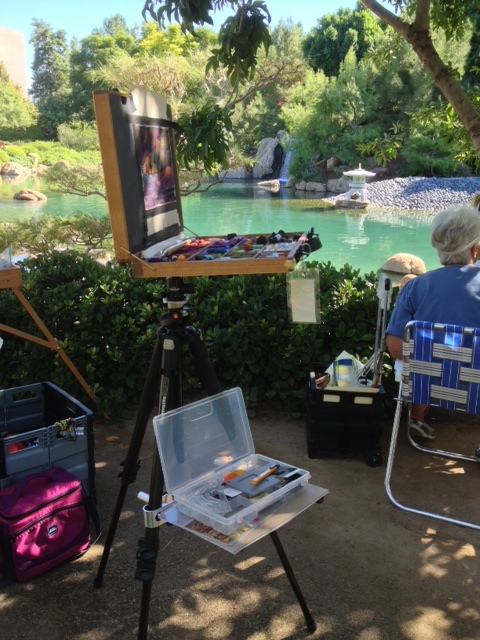 This is my first foray into plein air and I wasn’t about to buy a whole big box that I might never use again. Now that I know I like painting out-of-doors, I will go for a Dakota box that will fit right here on my Easel Butler and then I can really pile on the colours. Have a love affair with Max? Tell the world by adding your own photo here...just email me the image along with any related text and I will be happy to pop it in. 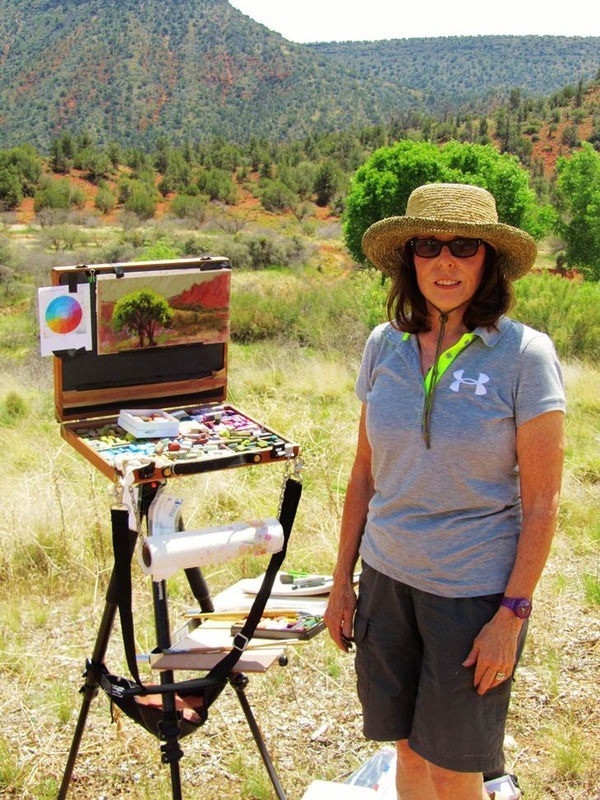 ◄ Here is Jann in the Sedona sun using Max as an auxiliary shelf below her All-in-One. She has really captured that unusually green tree behind her. ◄ Getting up-close and personal with a water fountain on the island of Hydra, Greece...2011. Catherine is taking full advantage of the Easel Butler's helping hands here using her ArtWorksBook and Max in lieu of a drawing table. This is a unique look for Max and hints of a creative side not seen before. You sly devil, you. 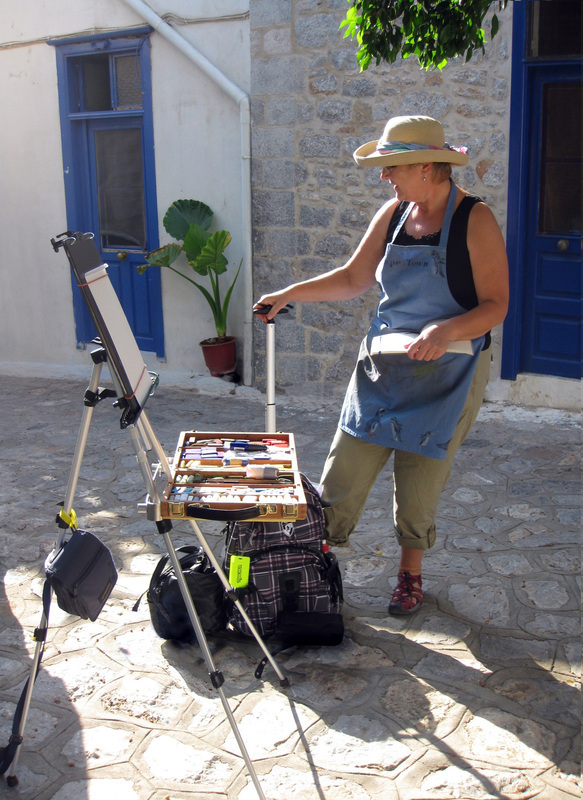 ◄ Here is Gail from Calgary, Alberta just getting set up in a bit of Grecian sunshine. 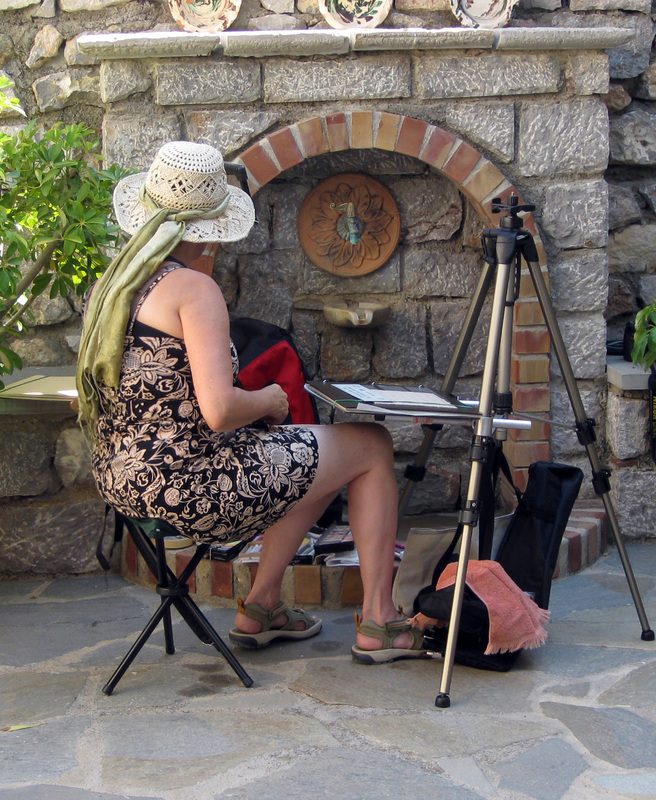 Notice her bag full of goodies hung on the back leg of her easel...a good idea with all of that weight on Max. He is sometimes too strong for his own good and needs a little counterweight to offset things when he flexes those muscles. Hmmm... Gail looks suspiciously like that silhouetted painter at the top of the page. And below we have Jane from Maple Ridge, BC. She's a bit insecure. You can tell by the bungee cord around her pastel box. 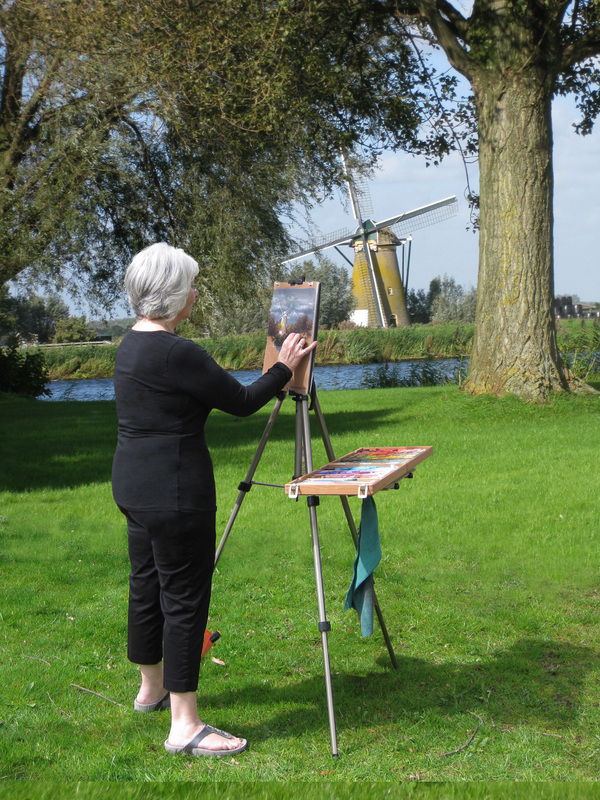 ◄ Dianna from BC, Canada painting in Holland. Here you see Max hugging the side of the tripod as opposed to the frontal approach. This is for those who love Max hanging around but need a little more of their own space. Is this what they call...tilting at windmills? I am so jealous...Max and ArtWorksBook get to hang out with the girls in all sorts of exciting places!! Two easel butlers with 4 Roz box pastel organizer trays from Richeson. It was a challenge to keep all four securely on the butlers but you can watch Dianna and see how it was done in this video. 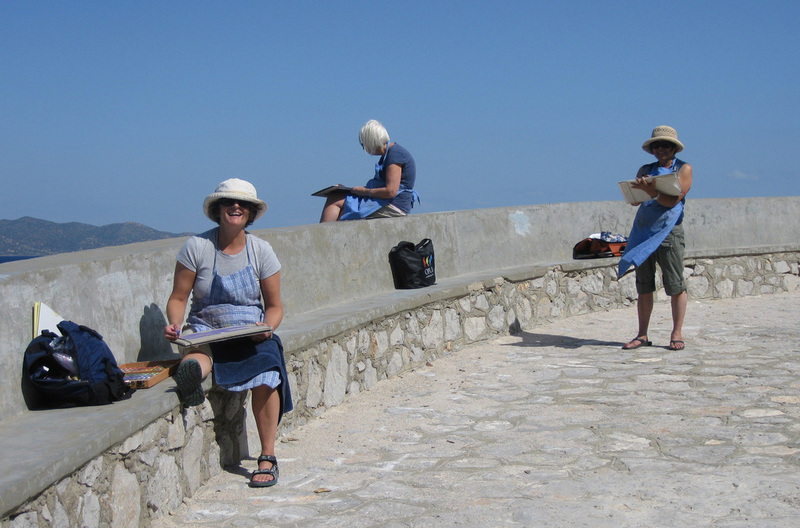 ◄ Three ArtWorksBooks enjoying the warm, breezy Mediterranean sunshine.